There are two visions of life, two kinds of people. The first see life as a possession to be carefully guarded.They are called settlers. The second see life as a wild, fantastic, explosive gift. They are called pioneers. These two types give rise to two kinds of theology: Settler Theology and Pioneer Theology. According Wes Seeliger in his book Western Theology, the first kind, Settler Theology, is an attempt to answer all the questions, define and housebreak some sort of Supreme Being, establish the status quo on golden tablets in cinemascope. Pioneer Theology is an attempt to talk about what it means to receive the strange gift of life. 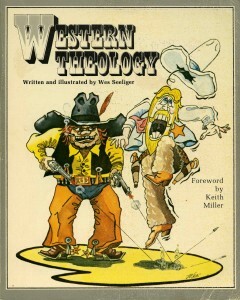 The Wild West is the setting for both theologies. In Settler Theology, the church is the courthouse. It is the center of town life. The old stone structure dominates the town square. Its windows are small and this makes things dark inside. Within the courthouse walls, records are kept, taxes collected, trials held for the bad guys. The courthouse is the settler’s symbol of law, order, stability, and—most important—security. The mayor’s office is on the top floor. His eagle eye ferrets out the smallest details of town life. In Pioneer Theology, the church is the covered wagon. It is a house on wheels, always on the move. The covered wagon is where the pioneers eat, sleep, fight, love, and die. It bears the marks of life and movement—it creaks, is scarred with arrows, bandaged with bailing wire. The covered wagon is always where the action is. It moves toward the future and doesn’t bother to glorify its own ruts. The old wagon isn’t comfortable, but the pioneers don’t mind. They are more into adventure than comfort. In Settler Theology, God is the mayor. He is a sight to behold. Dressed like a dude from back East, he lounges in an over-stuffed chair in his courthouse office. He keeps the blinds drawn. No one sees him or knows him directly, but since there is order in the town, who can deny that he is there? The mayor is predictable and always on schedule. The settlers fear the mayor, but look to him to clear the payroll and keep things going. Peace and quiet are the mayor’s main concerns. That’s why he sends the sheriff to check on pioneers who ride into town. In Pioneer Theology, God is the trail boss. He is rough and rugged, full of life. He chews tobacco, drinks straight whisky. The trail boss lives, eats, sleeps, fights with his people. Their well-being is his concern. Without him the wagon wouldn’t move; living as a free man would be impossible. The trail boss often gets down in the mud with the pioneers to help push the wagon, which often gets stuck. He prods the pioneers when they get soft and want to turn back. His fist is an expression of his concern. In Settler Theology, Jesus is the sheriff. He’s the guy who is sent by the mayor to enforce the rules. He wears a white hat, drinks milk, and outdraws the bad guys. The sheriff decides who is thrown into jail. There is a saying in town that goes: Those who believe that the mayor sent the sheriff, and follow the rules, they won’t stay in Boothill when it comes their time. In Pioneer Theology, Jesus is the scout. He rides out ahead to find out which way the pioneers should go. He lives all the dangers of the trail. The scout suffers every hardship, is attacked by the Indians. Through his words and actions he reveals the true intentions of the trail boss. By looking at the scout, those on the trail learn what it means to be a pioneer. In Pioneer Theology, the Holy Spirit is the buffalo hunter. He rides along with the covered wagon and furnishes fresh meat for the pioneers. Without it they would die. The buffalo hunter is a strange character—sort of a wild man. The pioneers never can tell what he will do next. He scares the hell out of the settlers. He has a big, black gun that goes off like a cannon. He rides into town on Sunday to shake up the settlers. You see, every Sunday morning, the settlers have a little ice cream party in the courthouse. With his gun in hand the buffalo hunter sneaks up to one of the courthouse windows. He fires a tremendous blast that rattles the whole courthouse. Men jump out of their skin, women scream, dogs bark. Chuckling to himself, the buffalo hunter rides back to the wagon train shooting up the town as he goes. In Pioneer Theology, the Christian is the pioneer. He is a man of daring, hungry for new life. He rides hard, knows how to use a gun when necessary. The pioneer feels sorry for the settlers and tries to tell them of the joy and fulfillment of life on the trail. He dies with his boots on. In Pioneer Theology, the clergyman is the cook. He doesn’t furnish the meat. He just dishes up what the buffalo hunter provides. This is how he supports the movement of the wagon. He never confuses his job with that of the trail boss, scout, or buffalo hunter. He sees himself as just another pioneer who has learned to cook. The cook’s job is to help the pioneers pioneer. In Settler Theology, faith is trusting in the safety of the town: obeying the laws, keeping your nose clean, believing the mayor is in the courthouse. In Pioneer Theology, faith is the spirit of adventure. The readiness to move out. To risk everything on the trail. Faith is obedience to the restless voice of the trail boss. In Settler Theology, sin is breaking one of the town’s ordinances. In Pioneer Theology, sin is wanting to turn back. In Settler Theology, salvation is living close to home and hanging around the courthouse. In Pioneer Theology, salvation is being more afraid of sterile town life than of death on the trail. Salvation is joy at the thought of another day to push on into the unknown. It is trusting the trail boss and following his scout while living on the meat provided by the buffalo hunter. The settlers and the pioneers portray in cowboy-movie language the people of the law and the people of the Spirit. In the time of the historical Jesus, the guardians of the ecclesiastical setup, the scribes and Pharisees and Sadducees, had ensconced themselves in the courthouse and enslaved themselves to the kw. This not only enhanced their prestige in society, it also gave them a sense of security. Man fears the responsibility of being free. It is often easier to let others make the decisions or to rely upon the letter of the law. Some men want to be slaves. After enslaving themselves to the letter of the law, such men always go on to deny freedom to others. They will not rest until they have imposed the same oppressive burdens upon others. Jesus described them this way: “They tie up heavy loads and put them on men’s shoulders, but they themselves are not willing to lift a finger to move them” (Matthew 23:4). Jesus wanted to liberate His people from the law—from all laws. Under His Word we become free, people of the Spirit; and the fellowship of free people grows up, as in the New Testament, beyond all kinds of theological disagreement. Paul writes in Galatians 5:1, “It is for freedom that Christ has set us free. Stand firm, then, and do not let yourselves be burdened again by a yoke of slavery.” If we are not experiencing what Paul calls in Romans 8:21 “the glorious freedom of the children of God,” then we must acknowledge that His Word has not taken sovereign possession of us, that we are not fully under the sway of His Spirit. Do the church groups recommend Brennan Manning’s books?